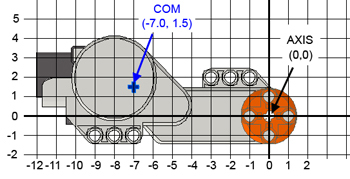 February 2007 update: Ryo Watanabe computed NXT motor constants from the curves below, as well as from his own measurements. Read more here. 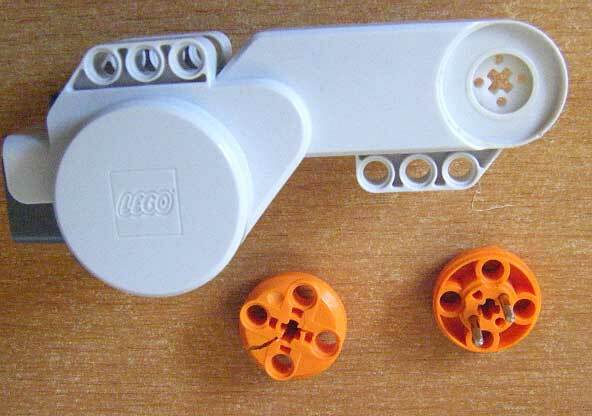 March 2008 update: Kevin Knuth of BrickEngineer experimentally determined the center of mass of NXT motor. 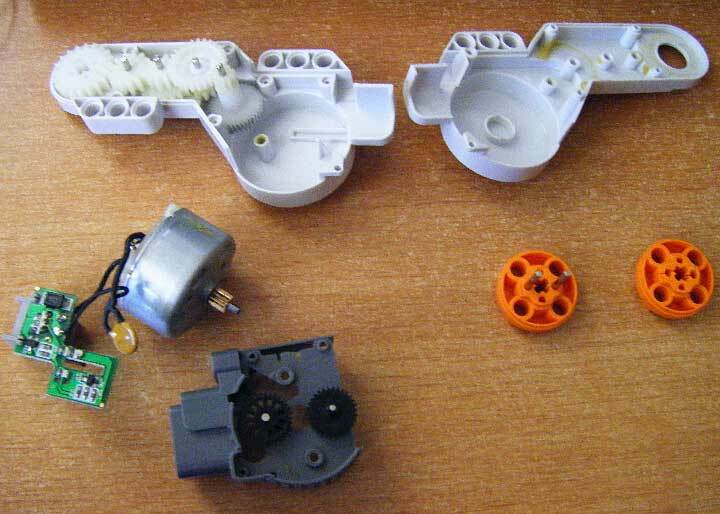 November 2008 update: Daniele Benedettelli sent me photos of a fully open broken NXT motor. See bottom of this page. The curves below shows NXT motor rotation speed (Rotations per Minute) vs. motor power level (supply duty cycle). Motor not loaded, 9V NXT power. Most noticeable here is the linear relationship between power level and motor speed. Much more practical than what we got with RCX where unloaded motor ran almost full speed at power level 2. Since there is no load to overcome, Power Control would have no effect here. Motor not loaded, but this time the NXT is powered at 7.2V (what you get with NiMH batteries). Of course, rotation speed is proportionally lower. Motor behaviour with a 11.5 N.cm load applied, no Power Control, 9V NXT power. Below 40% motor is stalled (horizontal region of the curve). Once enough power is applied, speed increases proportionally. 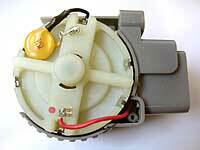 Motor loaded with a 11.5 N.cm, 9V NXT power. This curve shows the efficiency of Power Control: up to 70% the speed is the same as an unloaded motor. After that the curve is flat, the motor is actually running at full power. Note that motion as 10% was very irregular, even if average rpm is OK.
Motor loaded with a 11.5 N.cm, 7.2V NXT power. Up to 50% the speed is the same as a no-load, 9V powered motor (and actually faster than a 7.2V powered motor without Power Control!). The plateau appears at a lower duty cycle, since there is less energy available. The following charts show the characteristics of the NXT motor versus applied load. For the dark blue curves, the NXT was powered at 9V (voltage of alkaline batteries), the magenta ones were obtained at 7.2V (voltage of NiMH batteries). Power level is 100% for all charts. The current vs. torque shows a linear increase with the load. Because of power limitations in NXT driver, and thermistor trip current in NXT motor, I suggest that you don't exceed a 15 N.cm torque for extended time periods. Higher loads (thus current drains) are possible for short periods, but the protections will soon reduce current and available power. 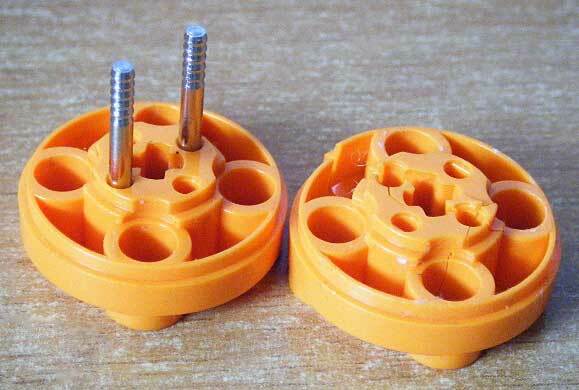 Warning: Separating the orange shaft parts is impossible without breaking things. Don't try that! 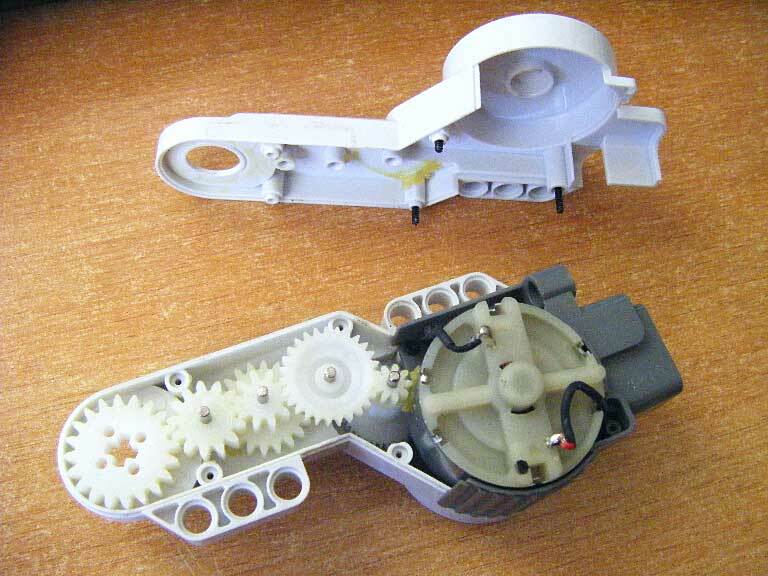 Also notice that reassembling the motor partially opened as I did can be tricky! 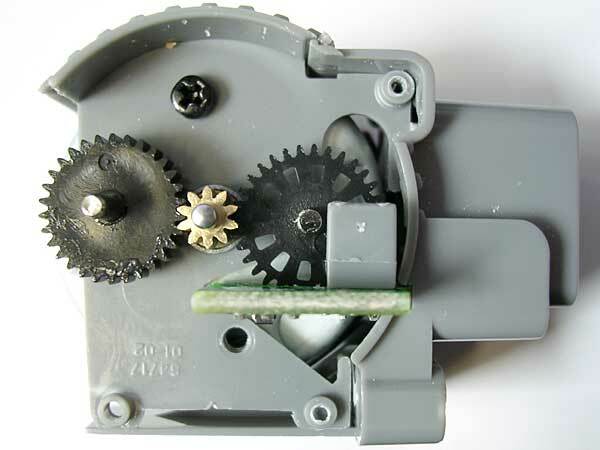 Once you have removed all seven screws visible outside (using a thin Torx T5 screwdriver), there is an eighth one to be removed inside... You can access it by flexing the plastic motor case. 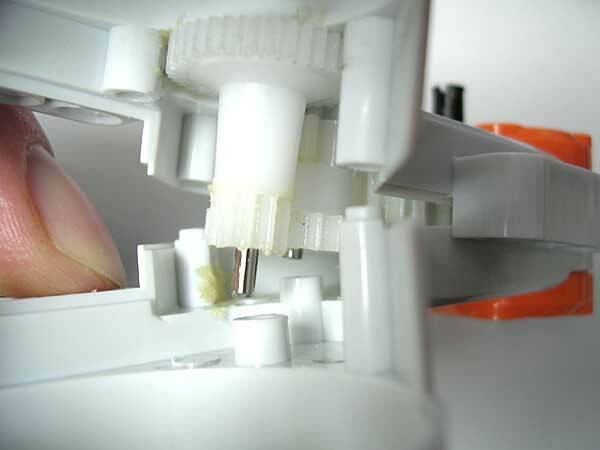 When all screws are removed, you can slide the motor assembly out of its case. 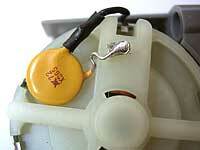 The yellow component is a resettable fuse that protects the motor and the NXT from over-currents. It's a Raychem RXE065 or Bourns MF-R065. The other side of the motor shows the encoder wheel and optical fork that provide rotation sensor function to the NXT motor. The motor and printed circuit board bearing motor connector and optical encoder. 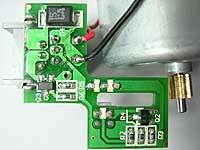 Bottom of the PCB, mainly used for optical encoder signal conditioning. The black rectangular component on top is a surge suppressor that clamps voltages to 15 volts maximum. 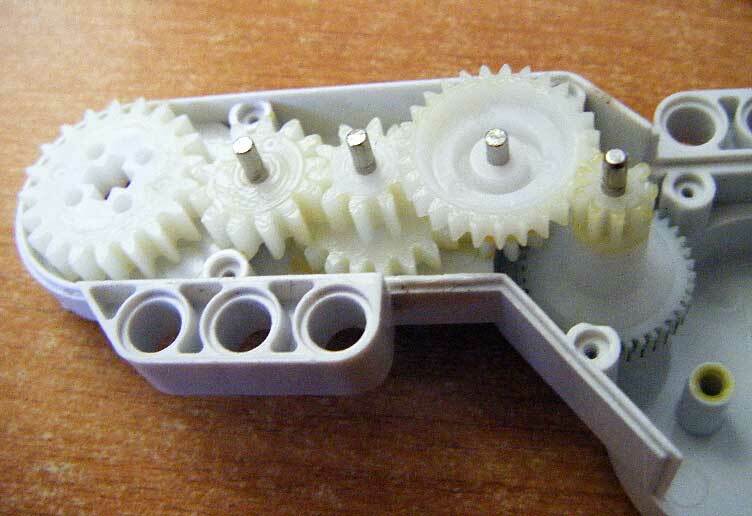 You may also have a glimpse on the gear train. Unfortunately, since the orange shaft parts can't be separated, we can't go further. 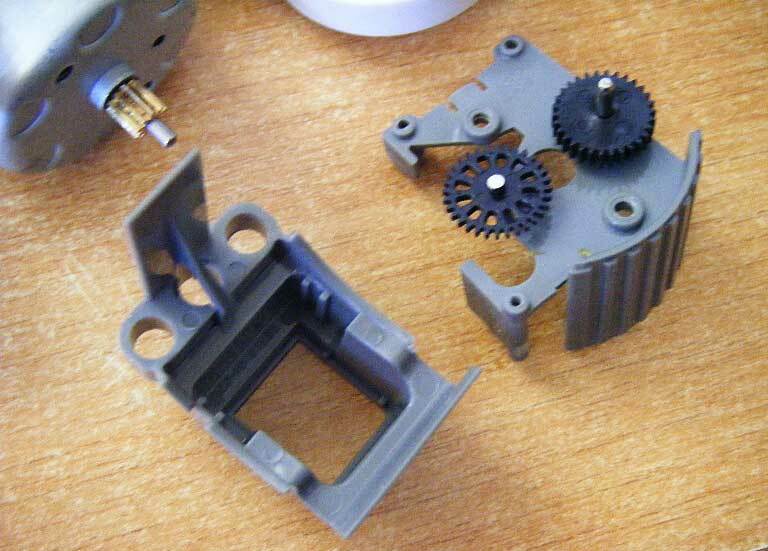 Here below are some photos of a broken NXT motor, fully open. Photos courtesy of Daniele Benedettelli. Output shaft of the motor broke under load! 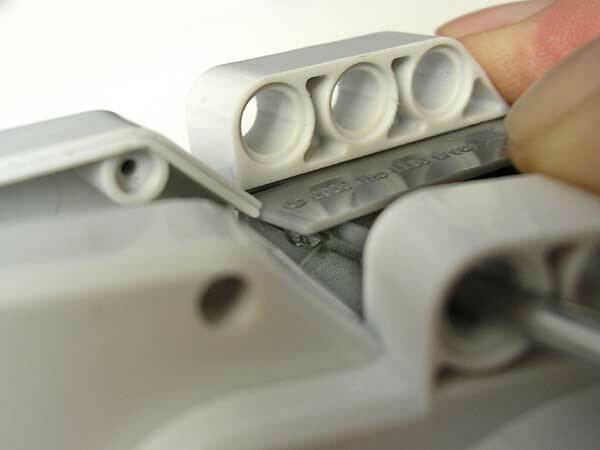 This photo also shows the asymmetric ribs on the metal pins explaining why it is impossible to disassemble the hub without breaking it. 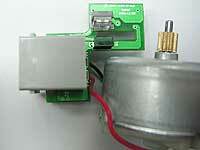 Encoder wheel and enclosure back parts. We have 12 slits in encoder, and motor to encoder gear reduction is 10:32. So for 1 turn of output hub, encoders turns 48*10/32=15 turns, optical detectors sees 15*12=180 slits. Using both sides of slits gives nominal 360 ticks per turn resolution. Note that since we have a quadrature encoder, the maximum resolution is 720 ticks/turn, but this is not used by standard NXT firmware. 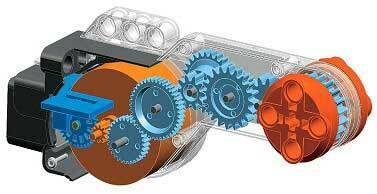 Exploded view of the motor.